« Why am I being blocked and can’t log-in or comment? Why is Docear showing a “The access to the file is blocked” warning? When this dialog appears, there is no other option than closing the PDF in your PDF viewer, or skipping the process of importing annotations for that PDF. 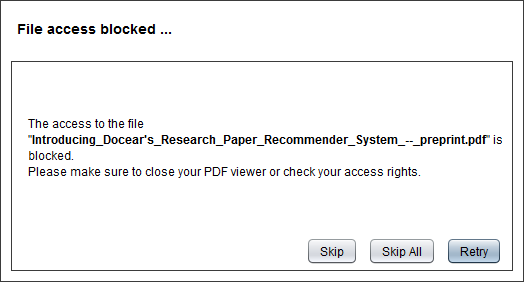 Currently, this dialog always appears when a PDF is opened in your PDF viewer, even when you have not created any (new) annotations in the PDF file. We know that this is not ideal and plan to change this. This means, in one of the next versions, Docear won’t show the warning message if the PDF does not contain any new annotations (if there are new annotations in the PDF, such a warning dialog is inevitable) . If this warning dialog annoys you too much, you might consider to use a PDF reader that does not block write access to PDFs. In this case, Docear could writes its own annotation IDs to a PDF although it is opened in a PDF viewer. However, we would not recommend this. If Docear changes annotation IDs while the PDF is opened in your PDF viewer, and you make some changes in your PDF viewer and save the PDF, Docear’s changes will be lost. This might result in unpredictable behaviour such as non-working links or a duplicate import of annotations in Docear. According to one user, a Windows PDF Reader that does not block writing access to PDFs is Foxit Reader 4.2 (or older). Please note that we will not provide support, if some of your data get lost because you used such an old PDF viewer!